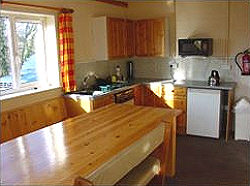 Our bunkhouse accommodation offers the highest standards in comfort and service and is open 365 days a year suitable for weekend or midweek breaks for individuals or groups, fishing clubs, ramblers, universities, schools, clubs, divers, canoe clubs, surfers, sailors, golfers, cyclists of up to 14 persons. 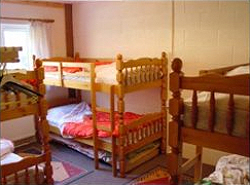 Parking is situated on a flat area 3 meters from the Bunkhouse. There are no steps to go into the Bunkhouse and no steps inside. There is wheelchair access to one bedroom (please note the beds are bunk beds), kitchen and a disabled toilet and washbasin is provided in the toilet block. Charges £20 per person to include a light breakfast, children under 10 - £10. Discount for more than 2 nights.